The Chiefs will play the San Francisco 49ers in game three. Chiefs head coach Andy Reid tends to use Week 3 of the preseason as a dress rehearsal for the starters, and this year that will happen against the San Francisco 49ers. The Chiefs say dates and times will be announced as soon as they are finalized. All four contests will be aired live on KCTV5. Many people were anticipating the schedule release on Wednesday. I was just over here looking forward to Brett Veach’s pre-draft press conference on Thursday. Thursday’s media availability was the closest we were going to get to Veach’s thought process heading into the most important week for team building of the entire year. He didn’t provide a ton of insight, but there was still plenty to pique my interest. Veach’s comments seem to indicate they aren’t as focused on players that require more development. His comments make me doubt you’ll see project players like Tanoh Kpassagnon from 2017 but more players they believe they can lean on early. That could shrink the board and change the approach drastically at certain positions. Know that whoever the Chiefs select next week in the first few rounds, they’re expecting an immediate impact. The Chiefs sound like a team that is keeping every option available at 29, including interior offensive lineman. I’d prefer they lean toward identifying an impact defensive player with their first pick, but Chiefs fans should be prepared for just about anything on Thursday. If they are going with more of the best-player-available approach, players like interior offensive lineman Garrett Bradbury could very well be on the table. He’s a perfect fit schematically, whether I’d be thrilled with the value of a center or not. Last year, Veach aggressively moved up the board to acquire the players he liked. He sounded Thursday like a GM who reflected on last year’s draft and might have tweaked his approach with new information he learned on the job. He’d go on to say he might need to be more tactical in certain areas. How he approaches this draft will be fascinating. We all expect those pedal-to-the-metal tendencies because the one-year sample size was so aggressive. Having four top-100 selections will be an interesting study. His overall approach has been making sure players he loves are in the building. Maybe we see a more of a balanced approach from Veach next week. Veach said they’ve accumulated eight other teams’ draft charts throughout the last few years. They’ve already had dialogue about hypothetical scenarios with teams to start working on framework to maneuver. Keep in mind that doesn’t necessarily mean trading up. We have a custom Chiefs trade chart based on the history of draft capital trades in the KC Draft Guide that will give us a close valuation of how teams will approach maneuvers around the board. 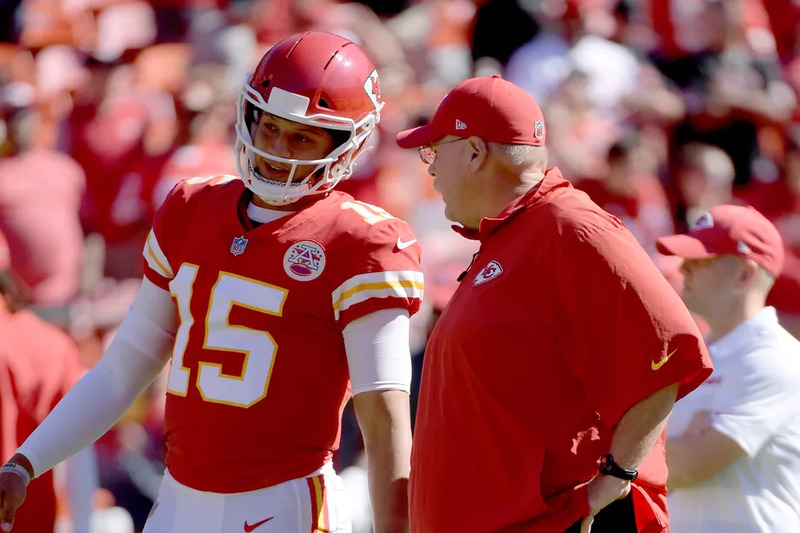 Expect the Chiefs to get Patrick Mahomes an offensive weapon somewhere in the draft. That statement and his valuations of the positional strengths off the class indicate what specific kind of weapon they’re targeting is fluid. It sounds like Andy Reid is drawing up all sorts of plays. Brett Veach says Andy Reid has a thick stack of index cards he calls his “Pat Plays.” Oh baby. Bring on 2019. I wouldn’t be surprised if some of Reid’s schematic thinking has a shopping list attached to it. Some of the concepts Reid may want to introduce could be tied to a player type they wish to add in this draft. Whatever weapon they add, rest assured Reid and company will know how to best utilize it. I’d anticipate it being addressed on day two. Sure sounds like that is where he sees the value. He’d also go on to talk about the quarterbacks going off the board early as well. These three positions off the board are both a blessing and a curse. Obviously, quarterbacks and offensive linemen off the board early helps, but you would hope there is a chance a defensive lineman could fall into striking distance of the Chiefs if possible. It could be unrealistic they have one in striking distance based on these comments. He’d also mention the cornerback class is strong in the first, second and third round. Based on his comments, where he sees the positions of strength that will go off the board and the Chiefs’ recent visits, you have to think there is a good chance the Chiefs address secondary in the top 50 picks. I wouldn’t rule out safety, however. If that’s the case, they could look at the scarcity of safeties and focus on it early. Remember that part of the reason the Chiefs traded up for Speaks is that they thought there wasn’t much behind him. If that’s the case, they could prioritize addressing it if they felt they weren’t going to be able to do so later.